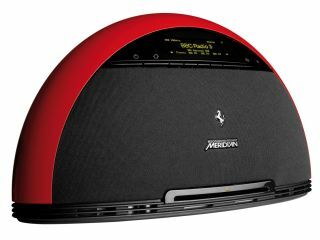 High-end AV maker Meridian has teamed up with Ferrari to produce a new tabletop home entertainment system - dubbed the F80 after Ferrari's sports coupé. The fan-shaped F80 features an FM/AM and DAB radio tuner, CD and DVD playback and a built-in 2.1 speaker system delivering 80W. The partnership extends further than the five official Ferrari colours that the system comes in. Apparently Ferrari offered Meridian practical advice on the materials and it could use to get the best sound from the system's design - in particular the composite alloy-injected material used to ensure that the F80's speaker enclosures were acoustically inert. The F80 itself features three power amps - one for each audio channel - plus specially designed full-range speakers. Meridian has also used its considerable experience in high-end audio and video playback for the F80's CD audio and DVD-Video playback. The unit also features a 'smart button' user interface with organic light emitting diode (OLED) display. The F80 is on sale now for £1,495. A range of luxury finishes will be available later in the year.